In Indian Vedic Astrology, horoscope is a snapshot of the positions of the planets in the sky at a given instance. Most typically, in Vedic Astrology the horoscope is prepared for the birth of a person. The term horoscope is derived from Greek words meaning, "a look at the hours." The basic idea of horoscope is to place the planets in their exact positions within the 360 degrees of the celestial circle. 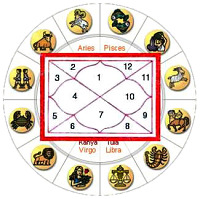 The celestial circle is divided into 12 equal parts called rashi or sign. Each rashi/sign is 30 degrees. Each rashi/sign is further divided into nakshatra/stars. A person's horoscope holds the key to knowing his/her personality traits. In a way, your horoscope is the mirror where you can see your past, present and future. The distinguishing feature of Vedic Astrology compared to its contemporary astrological theories is its ability to predict the timeline for major events (for example, education, love/relationships, marriage, birth of children, career changes, professional growth, financial gains/losses, retirement, spiritual growth etc) in the life of a person. Further, Vedic Astrology provides remedial solutions to certain negative aspects or events in person's life.